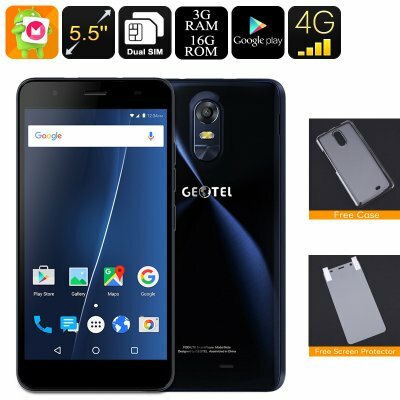 Successfully Added Android Smartphone Geotel Note - Quad-Core CPU, 3GB RAM, 5.5 Inch Display, 4G, Android 6.0, Dual-IMEI, Google Play (Blue) to your Shopping Cart. If you are looking for a cheap Android phone that is available for less than 100 US Dollar, yet features some sophisticated hardware and software alike – the Geotel Note is perfect for you. This affordable smartphone runs on an Android 6.0 operating system thanks to which it is able to treat you with a smooth performance. Capable of dealing with the latest software features and mobile applications – you’ll be guaranteed to undergo a powerful user experience with this Android smartphone. No matter the type of smartphone user you are, this mobile phone is guaranteed to meet all your demands. Play games, watch movies, send messages, and browse the web – nothing is too much for the Geotel Note Android phone. By supporting two SIM card slots and Dual-IMEI numbers, this Android phone conveniently allows you to stay connected to two phone numbers at the same time. Thanks to this, the Android phone offers a perfect platform for business people to separate their work and private life by using only one smartphone. Additionally, this mobile phone also supports 4G connectivity, through which it provides you with the fastest mobile data speeds available. No matter where you’re at, from now on you’ll always be able to browse the web, stream movies, and download files at the blink of an eye. Coming with a beautiful 5.5 Inch HD display, this Android smartphone will portrait all your favorite media in crisp 720p resolution. Providing you with access to the Play Store, you’ll always be able to download mobile entertainment and applications. Packing a powerful Quad-Core CPU, 3GB RAM, and a 3200mAh battery, you’ll be able to enjoy your downloads for hours in a row without needing to worry about running out of juice. Thanks to its internal memory of 16GB and the possibility to slide in a 32GB SD card slot, this android phone offers a sophisticated amount of storage for you to save all your files and media alike.